Balloon Animals: Because I hate my child. I’ve got a Woot! related project that’s going on, but I don’t have time to finish up the paint on it right now. My Beetlebot write-up is taking as long as the project itself did. I’ll be talking instead about one more reason why I shouldn’t be a parent. Talc has been linked to cancer and respiratory issues, which is why you won’t find much baby powder in many diaper bags anymore. Bits of thin, flexible rubber are an obvious choking hazard to all small children. Contact with latex is the leading cause of latex allergy, followed by inhalation of small latex particles. 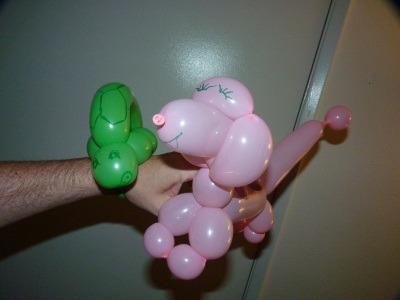 In completely unrelated news, I’ve started learning how to make balloon animals the other day. Either three or four days ago. It’s insanely simple. I’m surprised it’s a fairly rarely practiced skill. When I was rooting through the pack of balloon rejects I got at the dollar store for the Hover-Crap project I found a twisty balloon. I thought it was pretty funny, so I blew it up, and twisted together the classic dog shape from what I remember them looking like. It does take some practice, I suppose. I think some people might be put of f because that practice takes specialized equipment like a balloon pump. Thankfully, I finally found a use for years practicing trumpet and paying for private lessons: I can blow up even the really difficult ones by mouth. So no special equipment, just the balloons. Speaking of twisty balloon pumps, I found one at a NEW dollar store in our neighborhood, the Dollar Dollars store. As the name hints, it’s NOT actually a dollar store. It’s faking. It’s like the Family Dollar. Everything in the store that costs 99 cents costs 99 cents. Other items will cost other amounts. As for the pump, it lasted for 0.05 balloons. It got about 1/20 of the way in, and then stopped pumping. So in the last couple of days since the first dog, I’ve made a poodle and giraffe, which are pretty much dogs, a teddy bear, which is pretty much the dog, a turtle, which is a very, very small dog, an alien (two dogs and a water balloon), a couple of swords (half dogs), elephant (which is a large turtle, but still a small dog), and several different Tiggers. Don’t get me wrong, the Tiggers are also dogs, but they’re all different kinds of dogs. The first one was a failed monkey, and the only one I have a picture of currently. I’m already moving on to “designing” my own animals/characters. There’s more imagination in it than I thought, and it’s difficult not to be tempted to just look on the Internet to see how someone else made a character, but it’s pretty satisfying. At first you could only tell my Tigger because of the face I drew on him. 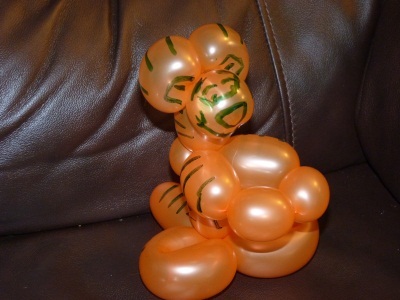 The most recent version looks a hekuva lot like Tigger without any Sharpie whatsoever. 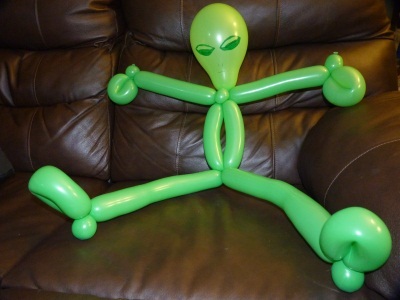 The Internet thing should be making balloon twisting a skill that everybody has. You watch a video, you twist the shape, and then you go do it in the London Underground until you get chased away. I’d think that people who learned how to do this professionally (the second most exciting four hour course at Clown College) would be pretty angry that it’s completely demystified. My plan is to pull this out whenever I’m forced to attend anything where my child is part of a group being led by another adult. This includes recitals, sports games, other kids birthday parties, and exceptionally well organized food fights. Quick note about our son: He’s due in one week. Our doctor is threatening to induce our wife before her due date. We will be laughing at him. Regardless, our next two or three weeks will be hours of walking a day, feeding her all sorts of weird and spicy foods, oils and teas, giving her foot rubs, and, uh, special alone time. All to get him introduced into the world in as natural (and non-painful) a way as possible. So this is why my projects are already slowing down in advance of his arrival. Ribbed For Your Pleasure Great knitting patterns! How Toddlers Can Accomplish What You Can’t.